Sarah Brokke Erickson has been a popular teacher of painting, drawing and art history at the College for a decade. Last year, as she approached her 35th birthday, she pondered how to express her gratitude to fellow artists whose work she finds inspiring. She conceived of Portrait of An Artist, a series of paintings of 35 peers, one for each year of her life. The project took more than a year. 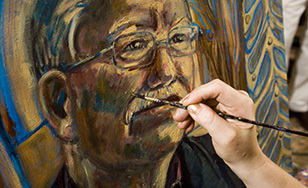 Each portrait is done in oils on a 20- by 20-inch canvas. St. Scholastica is well represented in the finished group, with paintings of fellow faculty members Ryan Vine, Sasha Howell, Patricia Hagen, Po-Lin Kosuth and John Steffl and former students Dan Branovan, Asha Long, Flo Matamoros and Tyler Johnson. The works will be on display at the Duluth Art Institute beginning Oct. 15, along with a book published at the same time. After the exhibition, Brokke Erickson plans one more expression of gratitude - she'll give the portraits to the subjects. What was the most interesting reaction from one of your subjects? One said, "I've never seen an image of me that ‘feels' like what I look like until I looked at this painting." What do you appreciate about portraiture now that you didn't at the start of this project? I have always known this to some degree, but I have found that portraiture offers a unique space in which you can acknowledge the process of ‘seeing' someone. Which might sound strange, but given our modes of seeing contemporarily, the weight of actually looking at someone can be a powerful experience. What can a painted portrait offer that an intelligently composed photograph can't? When you look at a painted portrait, you are looking at the act of someone representing their process of seeing, which, by its very nature, involves the element of time in a very different way. What's your favorite moment in the classroom? When my students discover what is possible, and through that discovery, find the courage to open even more doors they thought were previously out of reach. I have the opportunity to see students make what they thought was impossible, possible, and that has far-reaching implications for their life. What's distinctive about teaching at St. Scholastica? The community, the connection to the Benedictine Values, the commitment to learning within the Catholic tradition, all make St. Scholastica a wonderful place to be able to teach. What's your most challenging or least favorite aspect of teaching at the College? Our lack of a gallery space for our students to show their amazing art. We are working toward some solutions on that front, but for now, being creative about how we share the exemplary work of our students is imperative. There's an emphasis on career-preparation aspects of higher education. Why is a painting class worthwhile for students who probably won't become artists, and may not ever pick up a paint brush again? I am of the belief that expressing a creative impulse is what makes us human. While the physical tool of painting is a paintbrush, the act of painting resonates through all of a student's cognitive and professional experience. Problem solving, critical thinking, responding to both personal and public life, considering potential, all are part of taking a painting class. Whether a student picks up a brush after taking a course with me or not (and most actually do), they carry with them an experience that informs the rest of their lives. If there's a single painted portrait from any era that you wish everyone could see, what is it and why? Not sure! I did see a beautiful exhibition of the Dutch painter Rembrandt van Rijn, whose final self-portraits did what I think the best art does. They communicate his humanity, on a personal, intimate level, that, in turn, gives a lens to consider my life. Portraiture can also happen in work visually without the representation of human visage. You just have to look for it. "If I couldn't be an artist and teacher of art, I'd be a _____." Historian. I am able to teach my students much through art history, and on a personal level, I find many great insights to be had when researching the past. This is a relatively recent realization on my part and, interestingly enough, my mother is an environmental historian, so one would think I would have had a more direct path to my love for it. Can you share a painter joke or artist joke that cracks you up? If your doctor starts suddenly buying all of your paintings, you might want to get your affairs in order! St. Scholastica offers an undergraduate art major and minor. Students can choose from painting/drawing, graphic design or photography concentrations within the program. Learn more.